There's definitely a pattern here. The Navy SEALs have continued to use and upgrade the M60E3, (which came out in the 1980’s), because of its portability and low weight for its caliber. 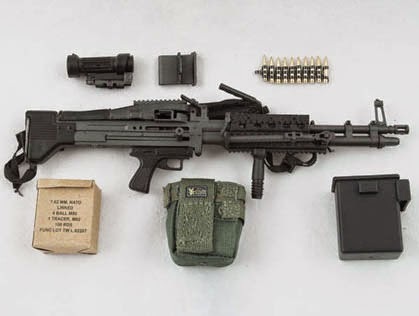 The MK43 Mod 0 is an improved model that was developed for the U.S. Navy SEALs in the 1990’s to replace their existing stock of M60E3 machine guns fitted with shorter “assault barrels”. It has extra rails for mounting accessories, and a quick-change barrel. The M60 machine gun is gradually being phased out in favor of the heavier M240 machine gun, which is more reliable. The US Ordnance MK-43 Mod 1 machine gun is fitted with the short (17.5 inch), fluted barrel. It is topped with a Trijicon Advanced Combat Optical Gunsight on the distinctively angular machined feed cover’s rock-steady integral rail and a PEQ-2A laser aiming module on the Mod 1’s new Rail Interface System forearm. The Tango Down vertical grip allows the weapon to be operated without a bi-pod by the shooter. This is likely the last evolutionary move for the M-60 before the SEALs start cutting down the M-240 into something more functional for a single operator (instead of as a crew-served weapon system). The limiting factor for this sort of weapon is the amount of ammunition that can be carried to support its use in the field. 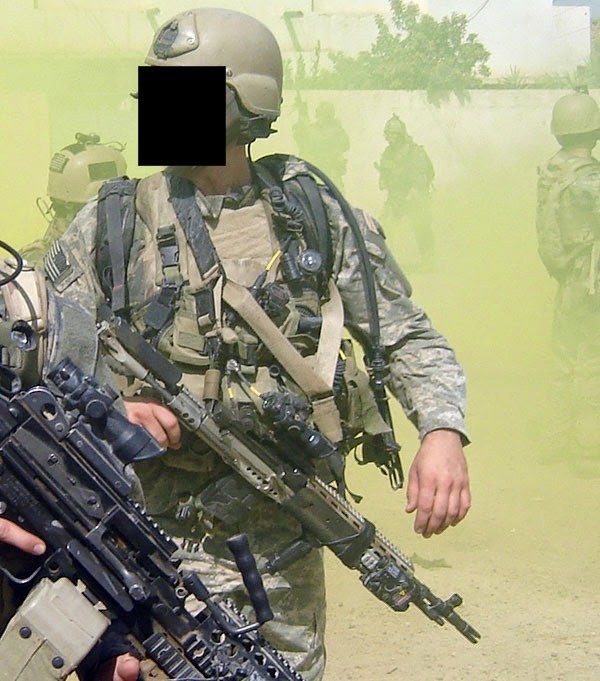 Though load-outs of SEAL platoon vary based on Team and platoon preference depending on the mission to be undertaken, the MK-43 is still a regular fixture. M-14 rifle is a selective fire weapon that replaced the M-1 Garand in US Army service. The military then transitioned to the M-16 rifle in the late 60's and by 1970, the M-16 was the standard rifle of the US military. However, a few M-14's remained. Elements of the US Navy bitterly held on to their M-14's -- Navy Underwater Demolitions Teams became SEAL Teams and they felt that the M-14 was a better choice for many applications. They had better range and more hitting power than the lighter M-16's. 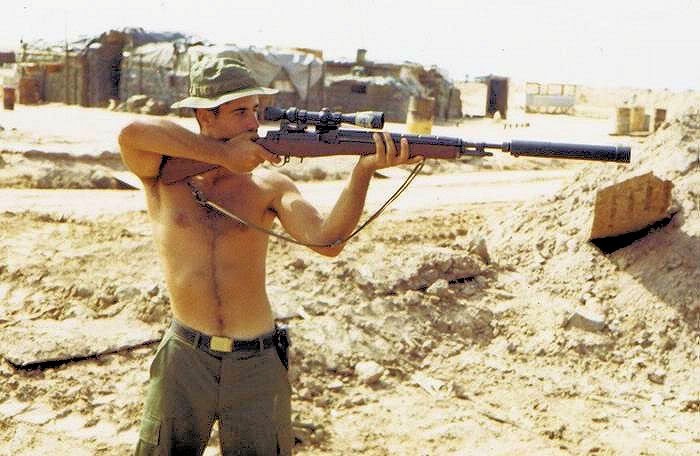 There was pressure for them to get turn in their M-14's. At one point, they claimed that they'd all been turned in... (hahaha). Then again, in that timeframe, the Navy still had M-1 (1918) Thompson Submachine Guns in inventory. What can I say? It has issues with letting go of what it loves. The SEALs were also told to turn in their handguns that fired .45 ACP and take the service issued 9mm handguns instead. That didn't work out either. When the weapon that you carry is a matter of life and death, you tend to go with something that actually works rather than the bureaucrat's choice for you. At least that was how the Navy saw it. One legitimate complaint about the M-14 was its weight. They weighed roughly double what an M-16 weighs, the ammunition is heavier and more bulky. But while the US Military wasn't thinking one-shot kills, the Navy was. When you are talking M-14 these days, it's only sort of your daddy's M-14. The M-14 EBR takes the standard M14 action and replaces the standard 22.0" barrel with an 18.0" barrel. The barreled action is then bolted into a telescoping chassis stock system, with a pistol grip, a different front sight, Harris bipod. The forestock is replaced by a Picatinny rail system and the "Navy flash hider" replaces the standard, lugged US military flash suppressor. A vertical foregrip makes the weapon easier to aim and shoot. Various sighting options are available. The Wind Talker silencer/suppressor is occasionally used in place of the the DC Vortex flash hider. I personally prefer the M-14 to the M-16. The M-16 CAR has its uses, and I have carried it at times, but it doesn't stand up to the M-14 as a combat weapon in my experience. This would be perfect for suppressing the feral hawg population in Central Texas in my opinion. I wish that a church group (hint-hint) would contribute to eliminating the feral hawg plague in Texas so that farmers could produce crops to feed a hungry world more easily. Buying these rifles for qualified shooters would go a long way toward solving this problem. (plug for LSP) If the Anglican Church buys me a rifle, I will bring my own ammo and will hunt the hawgs to extinction. Evenings will be spent BBQing steaks and roasting corn. How's that for a deal? There may be some on-the-road blogging as I trudge, hat in hand, through the Big Apple, begging for rich men's table scraps, occasionally throwing my hands in the air, screaming "I can't breathe". That's what people do in NY/NY these days, right? I'm not going to put tape over my mouth because that would keep me from eating pizza and alternatively screaming, "I can't breathe". Hopefully nobody throws a Heimlich maneuver chest lock on me while I'm trying to blend in with the rest of the liberals in the Big Apple. Therefore, I'm announcing here on this blog that my political correctness can only go so far - it has limits. My hypocrisy, however, would seemingly be limitless -- in New York, anyway.